In earlier times, the sliding barn door was a practical necessity on American farms, allowing large, heavy doors to move easily. In today’s modern homes, these popular doors provide a functional, yet stylish addition to complement a variety of architectural styles. The space saving design of interior sliding barn doors allow for privacy without taking up valuable space in a room like traditional swinging doors. 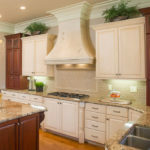 They are an excellent solution for pantries, laundry rooms, or any interior application where space is a premium. Lited doors are available with standard clear tempered glass or opal (frosted glass). 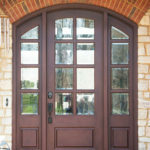 Additional door styles, species, and glass options available upon request. Cross members are surface applied, flush with the face of the door. Koetter Woodworking is pleased to offer Straight Strap, Bent Strap, and Top of Door barn door hardware systems. These stylish barn door options are available in Matte Black, Antique Bronze, and Stainless Steel finishes. track. Large wheels provide excellent strength and durability as‐well‐as smoothness of travel along the rail. Bent Strap features a modern face mount bent strap to hang wood doors on a traditional rail track. A slight variation of the Straight Strap, the bending of this strap appears to enclose the wheel and offers the same quality of travel along the rail.